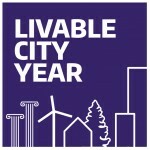 UW Livable City Year is looking for faculty interested in tackling real-world livability challenges with their students. 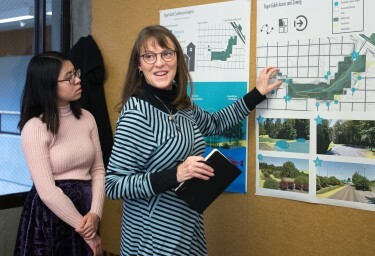 Professor Nancy Rottle, Landscape Architecture, reviews student designs for the LCY project Four Gulches: Restoring Human and Ecological Connections to Tacoma’s Ruston Way and Waterfront, Winter 2018. 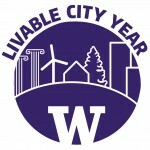 The Livable City Year (LCY) initiative connects UW faculty and their courses with local communities to build momentum around livability and sustainability projects. 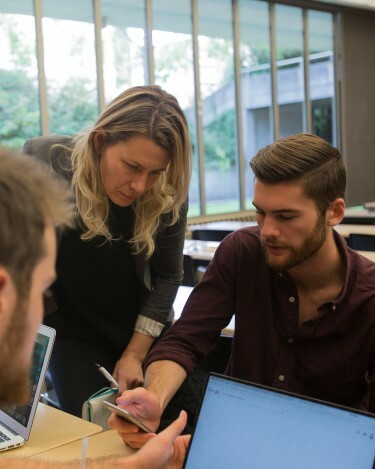 The program selects one partner community each year to work on a diverse array of projects across multiple disciplines on all three UW campuses. Our 2018–2019 community partner is the City of Bellevue and we are planning on conducting 25 projects over the academic year. Each project is led by a team consisting of UW faculty and city staff. A short Scope of Work agreed upon before the course begins describes the expected outcomes, deliverables, and timeline for the project. Faculty who are interested in working on a project as part of an existing course are encouraged to fill out our faculty interest form. Professor Rachel Berney, Urban Design and Planning, conducts background research with students for the LCY project Planning Video Library, Fall 2017. What are the potential benefits of conducting a community-engaged learning project through LCY? Logistical support for site visits, final presentations, etc. Students have opportunities to practice soft skills such as teamwork, presenting information, being accountable to a client, etc. Through LCY, you are part of a supported community of faculty learning how to conduct successful community-engaged learning, and you are building relationships and contributing to changes that endure beyond the year. What resources are available to faculty? The LCY program is supported by two faculty co-directors, a faculty representative on the Tacoma and Bothell campuses, and a full-time Program Manager. Our Program Manager provides support before, during, and after your course. Instructional support: The program provides each project up to $500 for instructional support, covering expenses such as materials and supplies, software, and room rental and Facebook ads for community input meetings. UCARs: The LCY program also covers UCAR rentals to transport you and/or your students on project-related trips. Reports: Each project culminates in a report that is written by one of your students and professionally edited and designed to showcase your class’ work. We provide training in professional writing to the student writers and pay them a stipend for their work. Evaluation: The LCY program conducts 360° evaluations of student, city, and faculty for every project to better understand how the LCY model contributes to the student, city, and faculty experiences. These evaluations are provided back to you to provide recognition of your work, support your reporting requirements, and help capture impact. 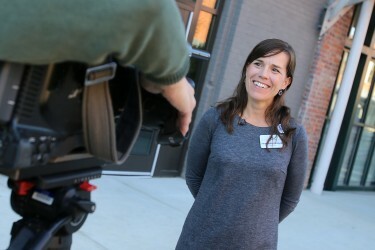 Professor Anne Taufen, Urban Studies Program, UWT, interviewed by local media at the LCY kick-off event in Tacoma, October 2017. We recognize that faculty have strict time constraints! If you have previously conducted community-engaged projects as part of your courses, you will likely find that working with LCY can make it easier to find and support a project, can reduce contractual paperwork, and can help augment your impact and publicity around your project. If you have not previously conducted community-engaged projects, we can help guide you through the process, such as helping you create an appropriately-sized Scope of Work, arranging travel to the partner city for fieldwork, and helping to coordinate community meetings. Both more-experienced and less-experienced faculty find they benefit from being a part of the LCY learning network. Both the partner community and faculty can submit project proposals for inclusion in the LCY portfolio. To submit a project proposal for consideration by the partner city, fill out our faculty interest form. Proposal review and matching between city Project Leads and faculty can occur until late Winter quarter of the partnership year; however, most of the project matching happens in late Spring and Summer quarters, prior to commencement of the partnership year. Once we have identified a potential faculty member and city Project Lead for a proposed project, these two individuals discuss whether the proposed project fits the course objectives. Often during these discussions, the faculty member can suggest a new way of approaching a problem, and the Scope of Work evolves accordingly. There is no obligation at this stage, but we do ask that these exploratory conversations happen soon after the potential match is made, so that we can continue our search if it is not a match. If both parties agree, then we have a match! What happens after the match is made? The faculty member and city Project Lead discuss and finalize the Scope of Work together. It is important that this is done prior to the beginning of the term, so that everyone’s expectations are in alignment. To propose a project, please fill out our faculty interest form and we will contact you with more information, as well as more information on potential projects. This is an expression of interest, and does not commit you to participate. LCY is part of a global community. The program is a member of the Educational Partners for Innovation in Communities Network (EPIC-N), an expanding network of 30 universities nationally and internationally that have adopted this model. If you have any questions or would like to discuss the program with the UW LCY team, contact Teri Thomson Randall, LCY Program Manager, at terir@uw.edu. Gerry Fiola (third from left), Chief of Security for the Port of Tacoma , gives students an insider’s tour of the port for this LCY project led by Professor Bob Freitag (fourth from right), Urban Design and Planning. Mitigating the Impacts for Port-Related Vulnerabilities, Winter 2018.